Class is used to separate society into 3 distinctive categories: lower class, middle class, and upper class. A person’s economic status will determine their place in the class system. Normally, those who make little to no income would be classified as lower class. Those who make an average income would be classified as the middle class (working class). Last but not least, those who are rich would be classified as upper class. The Drayton Rooftop was a major setting in Nella Larsen’s novel, Passing. Many characters went to the Drayton Hotel to grab a refreshing drink. Of course, not everyone was allowed to enter this magnificent place. Only people of high-class status and wealth were allowed. The picture above is an image of The Drake Hotel in Chicago. Surely, it does not have the name Drayton Hotel on it, but it was closely related to the Drayton Hotel mentioned in Passing. 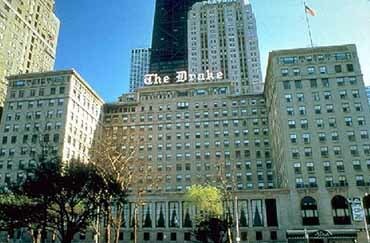 The Drake Hotel was located in Illinois, Chicago and it was constructed in the year 1920. Benjamin Howard Marshall was the one who was the credited architect. According to the Drake Hotel History, John B. Drake and Tracy Corey Drake were credited for financing this hotel in 1919. From here on out, The Drake Hotel became very popular and more wealthy people flooded the halls of The Drake Hotel. One of the most popular beverages was tea, it was like a signature drink in the hotel. The Drake Hotel was a well-known hotel in Chicago where a lot of wealthy people had their meetings and social gatherings. The Bulletin of the American Library Association states how there were several meetings that were held in the Drake Hotel, which was, Council and Executive Board meetings. These meetings occurred during the 1930s and consisted of wealthy, educated, white individuals. In addition, Former President George W. Bush went to the Drake Hotel in 2006. There he held a lunch meeting to celebrate Judy Baar Topinka for becoming the next governor of Illinois. This is important because even though Larsen’s novel introduces the Drayton Hotel and was written in the early 1900s, it was still being used in the early 2000s. Many more well-known people went to the Drake Hotel, for example, President Dwight Eisenhower, Walt Disney, and Ronald Reagan. The Drayton Hotel was basically for white, privileged people, the only way that Irene and Clare were able to access this hotel as if they were passing as white. Meaning that they had to act educated, and well-mannered. People of the higher class wore elegant clothing and spoke differently from those who were considered lower class because they were far more educated and had access to much more resources. “Call Us.” History – The Drake Hotel Chicago, www.thedrakehotel.com/explore/history. “Remarks by the President at Citizens for Judy Baar Topinka Lunch .” National Archives and Records Administration, National Archives and Records Administration, 7 July 2006, georgewbush-whitehouse.archives.gov/news/releases/2006/07/20060707-2.html. “Tentative Program of Midwinter Meeting: Drake Hotel, Chicago, December 28 to 31, 1931.” Bulletin of the American Library Association, vol. 25, no. 12, 1931, pp. 718–721. JSTOR, JSTOR, www.jstor.org/stable/25687518.